To glide through the water and rise in the air, what can be more enchanting? Carol Lowbeer’s new exhibit, “Waterbirds in Love,” captures this enchantment with 75 pictures of dazzling, colorful ducks, swans and geese in action. The waterbirds perform “spirited displays and “courtship” dances to impress each other while they pair up for their annual rituals. 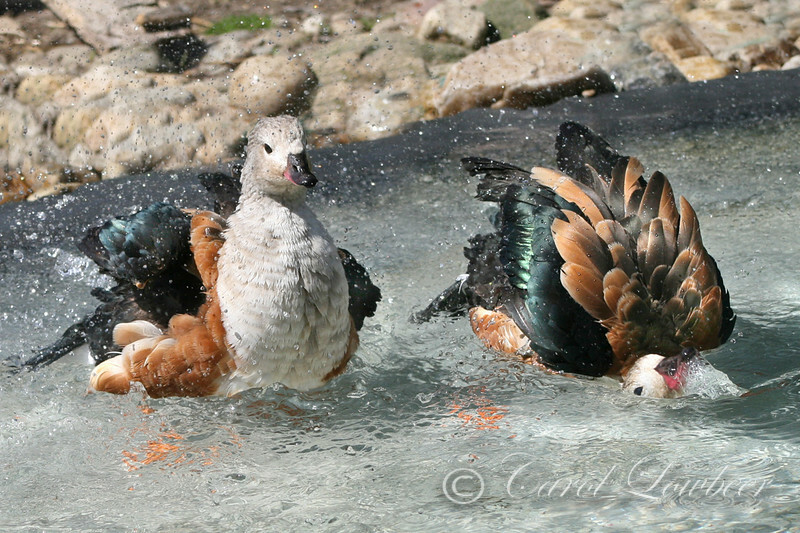 A “no holds barred” water bath takes place between two Orinoco Geese who hail from South America and reside at Livingston Ripley. The goose on the right has become so exuberant that she’s literally upside down in the water! The Orinocos are considered an endangered species as their numbers in the wild are declining.